PSP + old nano > new nano? So yesterday Apple did it again: Announcing something that I might eventually get. This time? New iPods in 4 different flavors. But I’m not yet sure if this is really worth it for me. The reason? I’m actually looking for a way to watch video shows like dl.tv on the go, so the new nano might not be such a bad idea and before going on vacation I might have been even more inclined to get it. But while on vacation I played quite a lot with my good old PSP and basically re-discovered it for me. Yesterday evening I then tried watching an episode of dl.tv with it and was quite surprised by how comfortable the experience is. 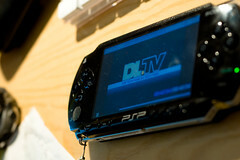 You can easily skip forward and backward in a video using the arrow keys, pause by using the start key and if you put the PSP in standby-mode it remembers the position of the playback later on when you want to resume. So only the extra weight might be a problem for some people, but not for me, since I’m quite used to taking everything except a TFT with me where ever I go ;-) Thinking about it again … I’m quite happy with this solution, so the new iPod nano’s rank on my wishlist just received quite a signification drop. Hmmm.